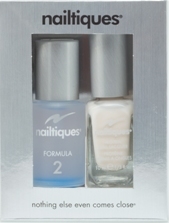 Nailtiques Color Lacquer with Protein works well with any formula of Nailtiques Nail Protein. Apply one coat of nail protein or Nailtiques Base Wear followed by two coats of color lacquer. Finalize with one coat of Nailtiques Quick Dry Top Shine. 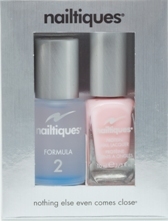 Nailtiques Formula 2 Kit and Nail Moisturizer is the perfect kit for multi-purpose use. This promotion includes: 1/4 oz. Formula 2, 1/4 oz. Oil Therapy, 1/4 oz. Cuticle & Skin Gel and 1 oz. Nail Moisturizer. 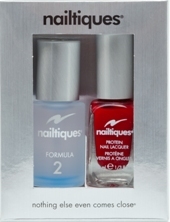 Nailtiques Oil Therapy is a delicate blend of vitamin-enriched oils for nails and cuticles. When used over wet polish, the oil can act as a drying agent to help set polish. Ideal for toenails. For initial use, apply Formula 2 once daily. As nails improve, decrease application. 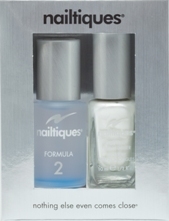 Formula 2 may be worn alone or with color polish. The nail protein is designed for one coat to be applied over the previous. Remove as needed (usually weekly) with a non-acetone remover and start again. The Cuticle & Skin Gel should be applied sparingly and regularly to dry areas of the skin and cuticles. Apply the Oil Therapy generously to cuticles and nails. Use several times a week under the nail tips. Apply at bedtime when the crème is least likely to be washed off.